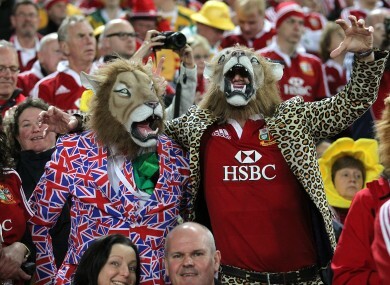 AN APPEAL FOR New Zealanders to “adopt-a-Lion” by billeting travelling fans during this year’s blockbuster British and Irish Lions tour has prompted an “overwhelming” response, organisers say. More than 20,000 Lions supporters are expected to travel south to see the Home Nations’ combined team take on the world champion All Blacks for the first time since 2005. But accommodation in the South Pacific nation has proved tight, particularly in the Test venues of Auckland and Wellington, with reports of exorbitant fees being charged for rooms. Worried that die-hard Lions fans were being priced out of a dream experience, New Zealander Adam Gilshnan launched a Facebook appeal for his fellow Kiwis to help out. The “Unofficial: British & Irish Lions 2017 Tour To New Zealand” page called for offers of free rooms or even a spot for travelling fans to park their campervans. “We Kiwis like to think we’re famous for our hospitality, so we thought we’d put it out there,” Gilshnan told AFP. Some New Zealand respondents have offered to host up to six fans, while Lions supporters have taken to Facebook to warmly praise the initiative. Gilshnan, 44, was inspired by his experience hosting Welsh fans during the last Lions tour to New Zealand 12 years ago. They returned the favour during a subsequent All Black tour to Britain and Gilshnan said life-long friendships were formed. The June 3-July 8 tour features 10 matches covering the length and breadth of New Zealand, including three Tests. Gilshnan said both sets of supporters enjoyed a close relationship and it promised to be “rugby nirvana”. “There’s no segregation like other sports, we’ll give each other a bit of stick during the match but shake hands at the end of it,” he said. Email “New Zealanders keen to 'adopt-a-Lion' for tour”. Feedback on “New Zealanders keen to 'adopt-a-Lion' for tour”.